Studies of the rocky shore in Sullom Voe and Yell Sound have been carried out annually since 1976. The abundance of selected plant and animal species are surveyed at various sites along transects on the intertidal shore. Annual rocky shore monitoring was launched in 1974 and is one of the longest running ecological datasets in the industry. The sites surveyed along the shore vary according to exposure to wave action. The same sites are re-surveyed annually to map changes as a result of the construction of the terminal. The survey mostly focuses on species abundance and this is compared to previous data. The latest survey conducted in 2012 showed very little change in species abundance since 2011 and any changes that were detected have been attributed to natural fluctuations. It was concluded that the current rocky shore communities are in good health, with no detected effects of terminal activities at the transect sites. Please click here to view the rocky shore monitoring reports. 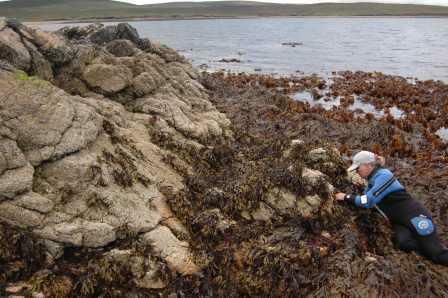 SOTEAG’s rocky shore dataset is one of the longest running and most valuable of its type in the UK. In 2001, the Marclim Project was given access to the data to help in their investigation of the effects of climate change on marine biodiversity. Using historic time series data and contemporary data, the project used key intertidal species whose abundance had been shown to fluctuate with changes in climatic conditions, as indicators of change in intertidal and offshore zones. Dog whelks are an intertidal snail found on rocky shores. They have been monitored biennially since 1991 as a part of the rocky shore programme, to monitor the long term impacts of Tributyl-Tin (TBT) stemming from anti-foutling paints used on supertankers at the Terminal’s jetties. Surveys carried out by the Scottish Office Agriculture, Environment and Fisheries Department (SOAEFD) in 1988 and 1990 showed a significant decline of dog whelk populations in Sullom Voe and near Yell Sound. The decline has been attributed to the use of TBT, which causes female dog whelks to develop male sexual characteristics, therefore preventing reproduction of the species. SOTEAG surveys have been used to determine the geographical spread of the effects of TBT, arising from oil tanks approaching and leaving the terminal. The use of TBT as an anti-foulant has gradually become restricted since the mid-1980s, including an international ban preventing its use entirely that came into force in September 2008. Monitoring continues in order to assess signs and rates of recovery in the dog whelk population, as the species gradually recolonize the shores.